The following maps, images and text are aimed at providing the reader of this web site with an overview of early Mackay Radio facilities on Long Island, New York. The station images and notes beginning on the next page are from the collection of George Flanagan. George has had a life-long interest in wireless history. The maps below are scans from a 1939 Long Island Esso Road Map belonging to the author of this site. 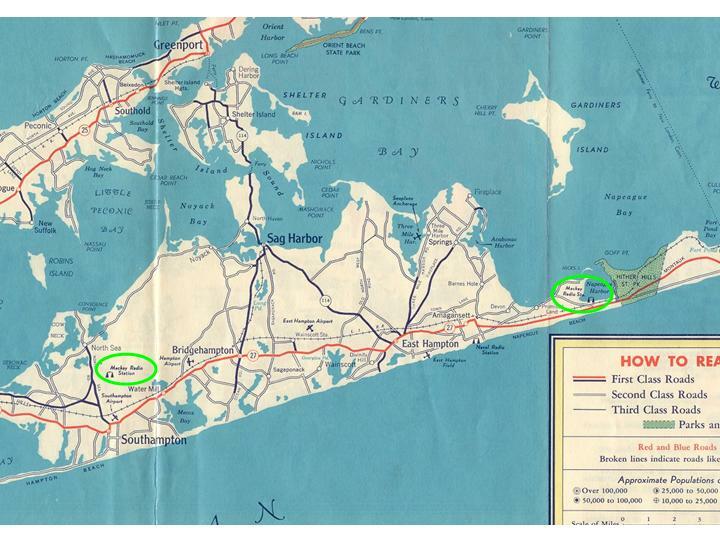 The radio stations (circled in green) were shown on this map because 68 years ago they were very visible points of reference for both automobile drivers and early Long Island aviators. Both map sections depict land in Suffolk County which was still very rural in 1939. The maps below are best viewed on a 19 to 21 inch screen. If anyone would like a copy of these scans to blow up to a larger scale, send me your email address and I will forward the .jpeg scans to you. 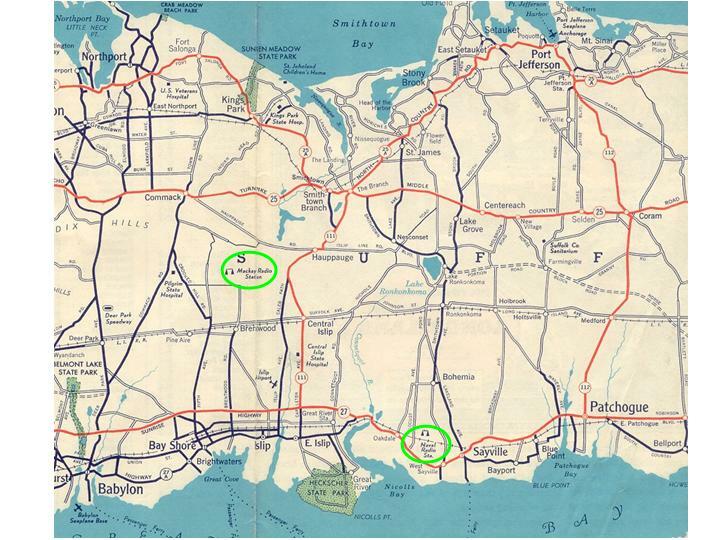 Map #1 below shows the Mackay Radio Stations at Brentwood (left) and Sayville (right). This map has the station at Sayville labeled as "Naval Radio Station". Mackay Radio leased this site from the Navy beginning in 1927. Map #2 below shows the Mackay Radio Stations at Southampton (left) and Napeaque (right). The station at Napeaque also was known as Mackay Radio's Amagansett or Montauk station.